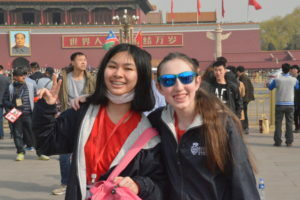 On Saturday, we went to Tiananmen Square and the Forbidden City. The square was huge and tour guide said that one million people could fit into it. We walked to the Chinese flag that was guarded by four guards. We took pictures of everybody before we continued on to the Forbidden City. The Forbidden City was large! It had three or four huge sections. The ground was layered with brick. It was 15 layers of brick to keep people out and prevent them from digging into the city. We walked into a smaller area where could see old vases, furniture, and other antiques, in the windows from the old Chinese emperors. We also stopped by a gift shop to get some souvenirs. I got three bracelets. After, we rode the bus to the mall to eat lunch at a Chinese restaurant. This entry was posted in China Tour 2018. Bookmark the permalink. Thanks you for the update! Post more pictures please! It is nice that you are learning so much! You are studying China in school and now you get to see the real thing! We are looking forward to hearing all about your adventures when you get home! We miss you!